How first class apps and websites exist together in todays mobile centric world is still up for some debate. I think over the coming months and years this particular relationship will become more consistent and mutually beneficial. 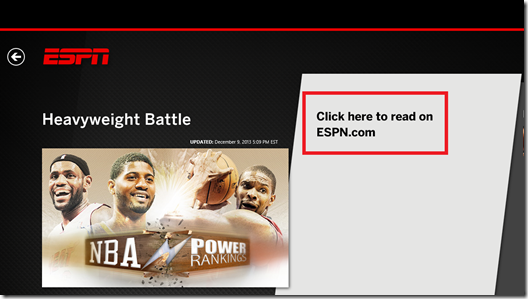 As of today, however, there remains some inconsistencies in the approach, here is one small example, let us observe the ESPN app for Windows 8. When we visit the website we are presented with a well position and tactful reminder that they have a dedicated app you can use. This is brilliant! I can opt to install it directly from this position, which works like a charm, or I can decline. This unfortunately is the moment you realize that the relationship between the web and the modern metro world becomes disconnected. The truth is that there is nothing tracking if you *have* installed the app, or if you have opted to simply say “no thanks” (that could probably be accomplished with cookies if they cared to). So I elected to install the ESPN app, and summarily choose to ignore all future prompts at the ESPN site. I then start using the app that they are clearly compelling me to install, and for the most part this app provides exactly what I would expect, but then I saw this [note: Click here to read on ESPN.com]. 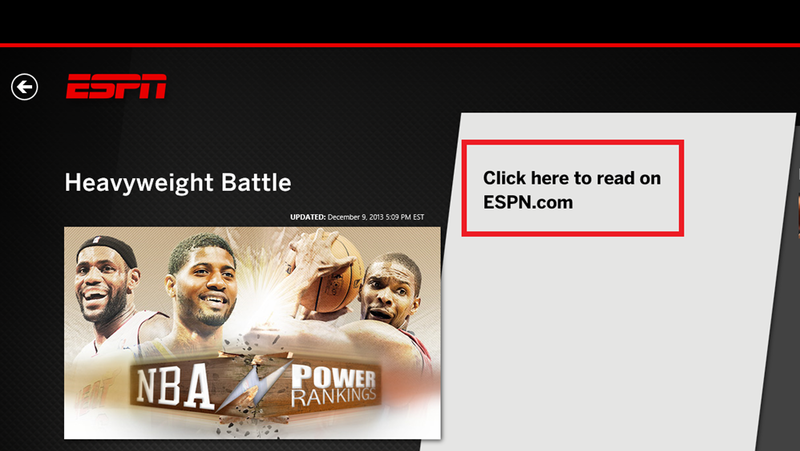 So after repeatedly telling me to use your app you want me to go back to ESPN to read a random article? <sigh /> I am sure the guys who develop apps for ESPN are brilliant, this is by no means a knock on them, but with Windows 8 straddling the fence between full blown PC, where web browsers are the app stores, and a first class app marketplace for devices, there will be some overlaps that make little or no sense.